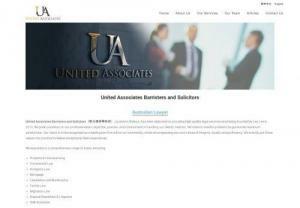 United Associates Barristers and Solicitors（ 联 众 律 师 事 务 所 ）, located in Balwyn, has been dedicated to providing high quality legal services since being founded by Leo Lee in 2013. We pride ourselves on our professionalism, expertise, passion, and commitment in handling our clients' matters. We strive to resolve problems to guarantee maximum satisfaction.